Cardiac auscultation is, in part, a technical skill that improves dramatically with intensive repetition in a short timeframe. The auditory learning process intrinsic to mastering heart murmurs follows proven psychoacoustic principles in that an auditory template of each new sound must be created by the brain in order to store that sound in long-term memory. In going from classroom learning in a monitored setting to clinical rotations using compact discs, we have found that the required number of repetitions (500) for mastery of each cardiac murmur can be achieved in a clinical setting within 15 minutes. With available Internet downloading of mp3 files containing the requisite auditory repetition, medical students, general internists and even cardiologists can now access this auditory learning at a time and place of their own convenience. In addition, web-based testing facilitates the use of a mastery model for clinical skill acquisition. Students often need to take the posttest more than once to demonstrate proficiency. Web-based instruction and testing allows repeated listening and testing in a convenient and cost-effective manner. The current state-of-the-art of cardiac auscultation can only be described as disappointing. Numerous studies1-5 over the last two decades have documented that medical students, residents, and even academic internists in many countries recognize less than 40% of abnormal heart sounds. In fact, cardiologists, who represent 5% of physicians in the US, are the only group that has been shown to recognize a majority of abnormal heart sounds and murmurs. The reasons for this lack of proficiency are complex and have been ascribed to a lack of opportunity to learn heart murmurs in the current medical curriculum as well as a lack of skilled role models in their instructors3. Whenever 95% of an audience is failing to master a skill, one questions whether that skill is being taught properly. When we contemplated the underlying cause for this lack of proficiency, it led us to a basic question: what do we know about how medical students learn to recognize heart murmurs? The medical literature is surprisingly silent on this question. We then asked a more basic question, namely how does any normal hearing adult learn to recognize a new sound? The answer to that question is psychoacoustics. This field is defined as the scientific study of the perception of sound. It is a basic science endeavor in which researchers record electroencephalograms on subjects while they listen to known and unknown sounds through a set of headphones. In an important paper in this field, Dr. Mercedes Atienza from the Harvard Medical School, exposed normal hearing subjects to a complex new sound and recorded their electroencephalograms during this learning process. Results demonstrated that when the brain begins to recognize a new sound, it forms a new wave on the electroencephalogram (EEG) called a mis-matched negativity wave. Once it appears on the EEG, this wave grows progressively larger over the next several days. Dr. Atienza and her group found that there was a fourfold range of repetition required for normal hearing subjects to master each new sound. In their study, anywhere from 1000 to 4000 repetitions of the new sound were heard over several hours resulting in an improvement in proficiency from 10% at the beginning of the study to 85% by the end of the study6. Similar results were found in a study of musicians, with jazz musicians having a more rapid learning curve than classically trained ones7. We were intrigued by this concept about how the brain learns a new sound and decided to conduct a proof of concept study with medical students to see if this psychoacoustic approach would apply to the learning of heart murmurs. We recruited 50 second year medical students of whom half sat in a classroom and listened to several hundred repetitions of the following four heart murmurs: aortic stenosis, aortic regurgitation, mitral stenosis, and mitral regurgitation. We tested the medical students on their ability to recognize these murmurs at a pretest, after they heard 250 repetitions of each of those four murmurs and again after they heard 500 repetitions of each murmur. The results demonstrated that the medical students recognized only 18% of these murmurs at the pretest but improved to 73% after 250 repetitions and improved further to 84% after 500 repetitions of each murmur8. An auscultation proficiency of 84% is comparable to that of most practicing cardiologists9. We divided our students equally into a monitored group who were directly observed during their auditory repetition exercises and an unmonitored group who received a compact disc with the same number of repetitions and listened to this material on their own time. There was no difference in the performance of these two groups. What really mattered was hearing 500 repetitions of each murmur which required approximately 15 minutes. All the students who completed this intervention were equally skilled in recognizing these 4 murmurs8. In the course of our study, we learned two important things about teaching auditory recognition of heart murmurs. First, we learned it was important to not vary the murmur being played. 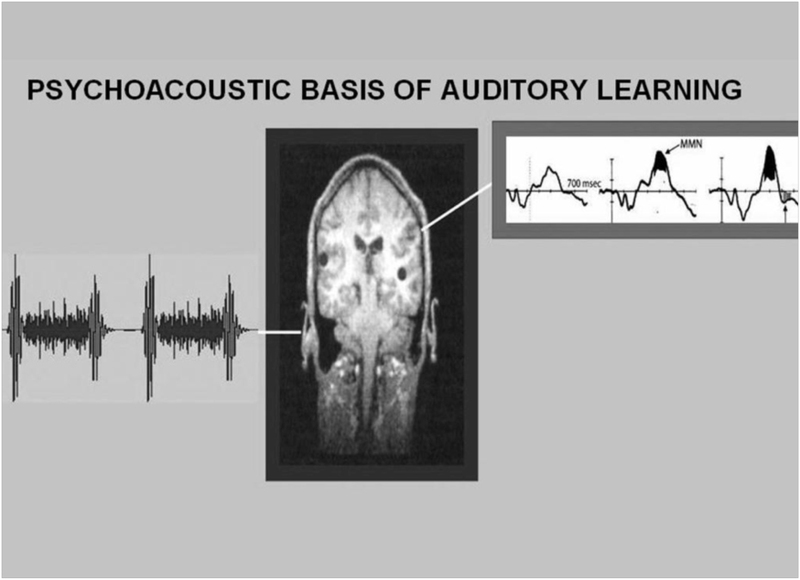 The rationale for this consistency is that the brain is creating an auditory template of that sound and if it hears a variation of the murmur, it disrupts the formation of that auditory template (See Figure 1). Accordingly, for our study, we used exactly the same example of mitral regurgitation for all 500 repetitions in our study. We followed the same procedure for the other three murmurs in our study. This figure illustrates the mechanism of how intensive repetition of a murmur, in this case mitral regurgitation, facilitates the brain’s creation of an auditory template of that murmur. As this auditory template is being created, a mismatched negativity wave (MMN) shown on the upper right, appears on the electroencephalogram and gradually enlarges over time. We also realized that this degree of repetition was a missing element in the current medical school curriculum. Namely, students are never given sufficient repetition to form an auditory template of each heart murmur. Consequently, they never master these murmurs either in their medical school rotations or in subsequent medical training. It’s not surprising then that they become residents and even attending physicians without this basic skill. The fact that auscultation proficiency improves dramatically with intensive repetition may seem counterintuitive at first. However, this is because there is an entrenched bias in medical education towards teaching auscultation as if it was an intellectual skill. This approach has been based on the mistaken assumption that the auditory recognition of heart murmurs can be improved with greater understanding of pathophysiology of these sounds. That is, if we, as instructors could provide our students with a better understanding of the etiology of these sounds, then they would be able to recognize them when they heard them in their patients. In fact, studies5,10 based on this assumption have been uniformly disappointing. On the other hand, once auscultation is seen as a technical skill, then the dramatic response to repetition makes sense. Although our work in the classroom convinced us that repetition was the missing element in teaching cardiac murmurs, we wanted to demonstrate that similar results were possible in a clinical setting. Accordingly, we embarked on a study to reproduce these results during a general medical rotation. We performed a controlled intervention trial with 80 third year medical students on an internal medicine rotation. Students were divided into an intervention group (65) and a control group (15). The 65 medical students in the intervention group listened to a compact disk (CD) containing 200 repetitions of four murmurs: aortic stenosis(AS), aortic regurgitation(AR), mitral stenosis(MS), and mitral regurgitation(MR) and two extra heart sounds(S3, S4) over a 30 day period. All heart sounds on the CD were simulated heart sounds. The 15 control students had no auditory instruction with the CD. All students underwent both pre and posttesting of auscultatory proficiency using human heart sounds. By self report, the intervention students listened to the CD an average of 2.5 times which averaged 500 repetitions of each heart sound for the group as a whole. Posttest results showed a significant improvement in identification of heart sounds from 39% to 89% in the intervention group. In comparison, the control group had no significant change in their pretest (37%) and posttest (34%) scores11. This study confirmed our earlier impression that intensive repetition was crucial for students to master a new cardiac murmur. The use of human heart sounds on the posttest demonstrated that students were able to generalize their auditory skill from a simulated heart sound on the CD to a human heart sound on the posttest. We gained additional insight into students’ learning needs from this study. Namely, the range of repetitions necessary for mastery of heart sounds was 200 to 800 beats with an average of 500 beats. The flexibility provided by independent listening to a CD was more efficient than classroom instruction in that some students needed less repetition while others needed more repetition for mastery. In addition, we found that many students uploaded the audio files to their MP3 players for convenience. This made the auditory exercises both portable and readily accessible. We were impressed by the resourcefulness of medical students in using MP3 players to achieve the needed repetition. In addition, we also wanted to stop taking the CD player to the classroom each month for the pre and posttests. Our interest coupled with technical advances of the internet allowed us to move the entire auscultation course to the web. We designed the following study to see if similar results could be achieved using the internet as the exclusive medium for teaching and testing the auditory recognition required for cardiac auscultation. In this study, 64 third year medical students were randomized to either an intervention group (50) or a control group (14). Pre and posttests were completed via a password protected university web site. At all tests, subjects listened to pre-recorded human hearts sounds in a randomized sequence and chose a diagnosis from a menu. The 50 students in the intervention group then downloaded an audio file in MP3 format from a university web page which contained 200 repetitions of four murmurs (AS,AR,MS,MR) and two extra heart sounds (S3,S4) and listened to it as many times as needed to achieve 70% mastery of these sounds. The control group downloaded a sham MP3 file with no auditory instruction. Similar to the prior study, there was a dramatic improvement in the intervention group from 29% to 82% and there was no significant difference in the controls (38% to 44%)12. This study demonstrated that an internet web site could be a powerful and cost-effective tool in teaching cardiac auscultation. Important insights into our students’ educational needs were also gained from this study. The students in the intervention group were permitted to take multiple posttests, each of which randomized the sequence of questions until a satisfactory passing score of 70% was attained. This approach permitted additional repetition of the material until mastery was achieved. As before, students reported that an average of 500 repetitions of each sound was needed for mastery. Furthermore, we had an opportunity to perform a follow-up assessment of auscultatory proficiency over time. Our 50 intervention students participated in an objective structured clinical skills assessment (OSCE) at the end of their clinical year which included one station of heart sounds. We were somewhat surprised to find that their proficiency declined the further they were from their auditory training. Students gradually lost proficiency over a 9 month period13. Beyond this time, their skills were no different from the control students. This observation supports the theory that cardiac auscultation is indeed a technical skill that is maintained with practice and deteriorates with lack of use. We also discovered that the success of this teaching model requires a clinical clerkship director to maintain the integrity of the course. To obtain these results, cardiac auscultation with auditory training had to be a required course with a minimum passing score. In our experience, medical students consistently express interest in auditory repetition methods, but many will not complete the task if left to their own devices. It is crucial for the effectiveness of this teaching strategy that the clinical clerkship director uphold academic standards similar to those in traditional courses. Based on our experience using the internet for teaching cardiac auscultation, we designed a completely web-based curriculum for the first 3 years of medical school. A total of 475 students were divided according to year. Each year took a pretest by logging on to a password protected university web site from which they would choose a diagnosis from a menu after listening to human heart sounds in a randomized sequence. All students then downloaded MP3 files which contain 200 repetitions of their respective heart sounds. One hundred seventy five first year medical students listened to five normal heart sounds, 175 second year students listened to five basic murmurs, and 125 third year students listened to five basic murmurs and two extra heart sounds. At the end of one month, all students returned to their respective web sites and took a posttest. All 3 classes showed significant improvement in auscultatory proficiency. The first year class score increased from 37% to 93%, the second year score increased from 43% to 95%, and third year score increased from 38% to 87%14. This study demonstrated that a web-based curriculum in cardiac auscultation could be highly effective across all levels of medical student training. Several advantages were noted in this web-based teaching module using auditory repetition. Overall, the vast majority of students (95%) reported a high satisfaction with this approach to learning. In addition, the course was accessible to the students at any time of day. As each student independently listened to audio files, there was as much repetition available as needed for each individual. Furthermore, using the mastery model of testing, posttesting was repeated an average of 4 times until a passing score was obtained. More importantly, 90% of students reported they were able to recognize these murmurs in their patients, reflecting the ability to generalize from trained (simulated) to untrained (human) heart sounds after this exercise. Ultimately, this study demonstrated a vast improvement in cardiac auscultation skills as compared to those previously reported for medical trainees. In the last few years several certifying examiners have begun to test auditory proficiency in recognizing heart murmurs on their computerized examinations. The National Board of Medical Examiners for medical students, the American Board of Internal Medicine examination for general internists as well as the Cardiovascular Boards for cardiologists, among others have used headphones to playback heart murmurs as part of their clinical cases. While that is true that accurate bedside auscultation requires more than just the ability to recognize a murmur on hearing it, it is arguably impossible to recognize these murmurs in a patient without being able to accurately recognize them on a quiz. We decided to explore the possibility that general internists and cardiologists already in practice could benefit from this innovative approach to teaching the auditory recognition of heart murmurs. We recruited 1045 general internists who were attending an annual meeting for internal medicine between 2006 and 2010. All participants took a pretest to assess their ability to recognize either basic heart murmurs or a set of advanced murmurs including bicuspid aortic valve and mitral valve prolapse. Each participant then listened to 400 repetitions of each murmur over approximately 90 minutes while viewing phonocardiograms, two dimensional echocardiograms and images relevant to the murmurs. They then took a posttest utilizing a randomized sequence of human heart sounds. The average pretest score was 46 %. There was no difference whether testing was done on basic murmurs or advanced ones. The average posttest was 77% (p<0.001 by paired t-test)15. These general internists were, on average, nine years out of their residency and generally expressed a high degree of satisfaction with this type of training. In 2013, the Cardiovascular Boards began testing the auditory recognition of heart murmurs for cardiologists. According to the medical literature, cardiologists as a group recognize approximately 80% of all heart murmurs. Most of these studies were done in the 1980s when a majority of practicing cardiologists had received training in phonocardiography during their fellowships. However, phonocardiography went out of practice with the arrival of two dimensional echocardiography in 1980. We wondered if cardiologists’ auscultation skills had declined with the advent of 2 dimensional echocardiography. Accordingly, to test this hypothesis we created the Heart Songs Learning Laboratory, an interactive workshop to test and teach heart murmurs to cardiologists attending the annual meeting of the American College of Cardiology between 2011 and 2014. Overall, 1098 cardiologists attended this program and completed both a pretest, the training modules and a posttest. Once again all pre and posttest sounds were high quality recordings of human heart sounds while the teaching sounds were simulated heart sounds. Following the pretest, all participants listened to approximately 400 repetitions of each sound (averaging 12 minutes per murmur) while viewing phonocardiograms, two dimensional echocardiograms and cardiac catheterization images relevant to the murmurs being heard. Basic murmurs included aortic stenosis, aortic regurgitation, innocent systolic murmur, mitral regurgitation, and mitral stenosis. The advanced murmurs included bicuspid aortic valve, mitral valve prolapse, hypertrophic cardiomyopathy, atrial septal defect, patent ductus arteriosus, combined aortic stenosis and regurgitation and combined mitral stenosis and regurgitation. A posttest consisting of 5 questions for each module immediately followed the training and consisted of a randomized sequence of basic murmurs or advanced murmurs depending on the module chosen. The pretest score on the basic heart murmurs was 47 % and rose to 88% on the posttest (p<0.001 by paired t-test). On the advanced murmurs, cardiologists scored an average of 64% correct at the pretest and this rose to 92% on the posttest (p<0.001 by paired t-test). We were surprised at the relatively low level of proficiency in the pretest phase of both of these modules, however we were gratified by the marked improvement in a relatively short period of time. In summary, these data demonstrate that cardiac auscultation is, in part, a technical skill that improves dramatically with intensive repetition in a short timeframe. The auditory learning process that is intrinsic to mastering heart murmurs follows proven psychoacoustic principles in that an auditory template of each new sound must be created by the brain in order to store that sound in long-term memory and be able to recognize it in future encounters. In going from classroom learning in a monitored setting to clinical rotations using compact discs, we have demonstrated that the required number of repetitions (500) for mastery of each cardiac murmur can be readily achieved in the clinical setting. With the advent of readily available Internet downloading of MP3 files containing the requisite auditory repetition, medical students can now access this auditory learning at a time and place of their own convenience. In addition, web-based testing facilitates the use of a mastery model for clinical skill acquisition. We found that students often needed to take the posttest more than once in order to demonstrate that they have mastered the skill. Web-based testing allows this repeated posttesting in a convenient and cost-effective manner. Like other technical skills, auscultation declines with a lack of use over time. Specifically in nine months time, if this auditory skill was not refreshed, it declined to pretest levels. This indicates a need for ongoing training especially for those students or clinicians who do not regularly have exposure to a variety of cardiac murmurs. This would also imply that different clinicians will need to master different sets of sounds. For example, cardiologists need to be conversant with a wide range of murmurs including not only basic heart murmurs but more complex sounds such as combined mitral stenosis and regurgitation. Primary care physicians, on the other hand, will not hear these murmurs sufficiently often to remain skilled in recognizing them. However, primary care physicians need to be skilled in recognizing a number of common heart sounds that occur often enough in a primary care setting to warrant their mastery, such as innocent systolic murmurs, physiologic third heart sounds, splitting of the first and second heart sounds and the systolic ejection click of a bicuspid aortic valve. We believe that the future of teaching cardiac auscultation lies in a combination of classroom instruction to explain the rationale behind this skill acquisition coupled with auditory repetition exercises delivered as MP3 files over the Internet. MP3 files of the 5 basic murmur used in our studies are currently available for free from the American College of Cardiology through their website at www.cardiosource.org/Heart Songs. In addition, there is a comprehensive curriculum of auditory repetition exercises of 20 different heart sounds and murmurs based on psychoacoustic principles currently available to 54 medical schools in the United States and Canada through the American College of Cardiology’s institutional website. 1. Marcus FI. The lost art of auscultation. Arch Intern Med. 1999;159:2396. 2. Tavel ME. Cardiac auscultation: A glorious past-but does it have a future? Circulation. 1996;93:1250-53. 3. Mangione S, Nieman L, Gracely E, Kaye D. The teaching and practice of cardiac auscultation during internal medicine and cardiology training. Ann Intern Med. 1993;119:47-54. 4. Paauw DS, Wenrich MD, Curtis JR, Carline JD, Tamsey PG. Ability of primary care physicians to recognize physical findings associated with HIV infection. JAMA. 1995;274:1380-82. 5. Roy JD, Sargeant J, Gray J, Hoyt B, Allen M, Fleming M. Helping family practice physicians improve their cardiac auscultation skills with an interactive CD-ROM. J Contin Educ Health Prof. 2002;22:152-59. 6. Atienza M, Cantero JL, Dominguez-Marin E. The time course of neural changes underlying auditory perceptual learning. Learn Mem. 2002;9:138-150. 7. Tervaniemi M, Rytkonen M, Schroger E, Ilmoniemi R, Naatanen R. Superior formation of cortical memory traces for melodic patterns in musicians. Learn Mem. 2001;8:295-300. 8. Barrett M, Lacey C, Selkara A, Linden E, Gracely E. Mastering cardiac murmurs: The power of repetition. Chest. 2004;126:470-475. 9. Etchells E, Bell B. Does this patient have an abnormal systolic murmur? JAMA. 1997; 277:564-571. 10. Mangione S, Peitzman SJ, Graceley E, Nieman LZ. Creation and assessment of a structured review course in physical diagnosis for mediucal students. J Gen Intern Med 1994;9:213-218. 11. Barrett M, Kuzma MA, Seto C, Richards P, Mason D, Barrett D, Gracely E. The power of repetition in mastering cardiac auscultation. Am J Med. 2006;119:73-75. 13. Kuzma MA, Barrett M, Cohen D, Seto T. Traditional versus acoustic training in cardiac auscultation: outcomes at 12 months. Teaching and Learning in Medicine. 2006;18(2):172-173. 14. Barrett M, Kelepouris E, Lopez C, Kaplan L. The power of web-based training in cardiac auscultation: A quality improvement study. JACC. 2008;51(10):A267. 15. Martinez M, Ayub B, Barrett M. Is auscultation the achilles’ heel of sports screening? Circ.2012;126:A9502.